Bread in the diet of the Russian people is one of the first places some people eat all meals with bread, including pasta, dumplings and other flour products. But the consumption of bakery products in large quantities is harmful to the body, can lead to the accumulation of excess fat, the emergence of problems with the stomach and intestines. To abruptly abandon the bread is often difficult, so it is advisable to gradually replace it with other products. Bread - harm or benefit? To proceed immediately with fresh bread and dry bread and hard biscuits, so the first time it is recommended to choose less harmful breads such as rye or whole wheat flour. Bread from rye flour contains more vitamins and minerals, including the need for a person potassium and magnesium. Rye has the useful property that rid the body of toxins and salts of heavy metals. In rye bread contains fewer calories and a lot of amino acids and polyunsaturated fatty acids. Whole wheat flour is made from the same wheat grain, like regular flour, but the grains are not separated from shells, which contain all valuable substances. Bread from such flour is high in fiber, which cleanses the intestines, there are vitamins E and b, minerals, antioxidants, it has more complex carbohydrates than simple, which are considered harmful. Thin pitas are often prepared without yeast, so they are also healthier bread. Before you buy a bread, carefully read the composition. Often under the "whole grain bread" is just a regular bread from wheat flour, which added a bit of whole wheat flour and flavor enhancers. It is also advisable to buy a branny and unleavened bread. Gradually instead of bread, you can start eating bread, cookies, crackers and other products from cereals or flour. Crackers, made of ordinary bread is healthier because it is easier to digest, contain more fiber and more difficult to eat in the same amount. Biscuits are also made from flour but they are less calories than bread. In addition, crispbread, rye, flax, or buckwheat flour is useful, but make sure that their composition was not yeast. Bread made from extruded grains of different crops: wheat, rice, oats, buckwheat, corn. Eat soft or crunchy cereal from the same or different, add some seeds, nuts, bran. Choose breads that do not add flour, yeast, starch and artificial additives. If you sat on a strict diet and decided to refuse the flour products, and breads seem to be tasteless and too hard, you can make substitutes of bread from other products. For example, in the East common recipes patties of chickpeas, peas or other legumes. From bean puree, eggs, water and vegetable oil is cooked weight, which lay out on a baking sheet in a thin layer and baked. The result is a big cake that can be cut into pieces and used as bread. 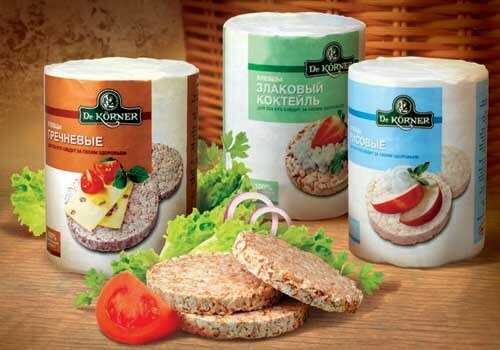 One can make sandwiches with butter and different fillings. Also, instead of bread you can bake the nuggets of chickpea called Panis.